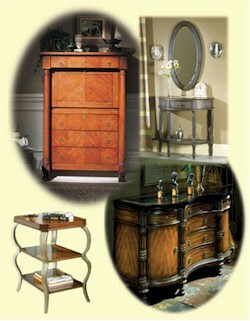 Butler uses only the finest-quality woods, veneers, and hand-carved craftsmanship in its collections. The Heritage Collection, Butler¹s flagship line, fuses enduring design, exquisite carving, and carefully selected solid mahogany and fossil stone into a classic line of home accent pieces. All Butler collections are design-driven, immaculately crafted, and sharply priced ­ resulting in exceptional value for North American consumers. Browsing through the bombe chests, hand-painted consoles, distinctive secretaries, decorative tables, popular British-inspired game tables, and other fine occasional furniture featured in this catalog underscores why Butler is recognized as a leader in occasional and accent furniture.